So, back in April, a friend let me know that his brother’s birthday was coming up. There’s a tradition in their family of celebrating birthdays with a cassata cake from Corbo’s Bakery in Cleveland. Unfortunately for them, they live in California now and shipping a cake out from Cleveland was a thing that was just not happening. So we settled on a plan to make one. Most of the work of this cake is prep work, which made this a topsy turvy experience since, for the cakes I usually make, the prep is the easy part and assembly is the hardest. But, unlike with my usual buttercreamed beauties, there was no way I was going to seriously attempt to create a smooth whipped cream surface on the cassata cake. So I didn’t fuss about it, and things actually got easier as we got further along. I credit both of those lovely bloggers, along with my lovely baking assistant/cameraperson–who had a steadier hand than I when it came to splitting a sponge cake in half–with how well this cake turned out. I’m told it tasted just like the cake from Corbo’s. Another person, a fellow non-Ohioan, compared it to a cake from an Asian bakery; I guess those also tend to be light and fruity. Whatever you might like to compare it to, the cake was definitely delicious. My opinion of sponge cakes is permanently changed for the better. By the end of the evening, there was this much left. And, not too soon after, it was all gone. Preheat the oven to 325 degrees. 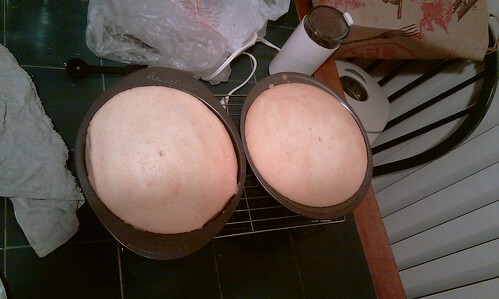 Line the bottoms of two 9-inch round cake pans with lightly oiled parchment paper. Otherwise, leave the pans ungreased. In a large bowl, sift together the flour, 1-1/4 cups sugar, baking powder, and salt. Then re-sift. In a separate bowl, beat together the yolks, water, oil, lemon zest, and vanilla until smooth. Stir into the flour mixture. And in another bowl, beat the egg whites with the cream of tartar until soft peaks form. Add the remaining 1/4 c. sugar, and beat on high until the peaks are stiff but not dry. Fold about a quarter of the egg whites into the egg yolk mixture until well combined. 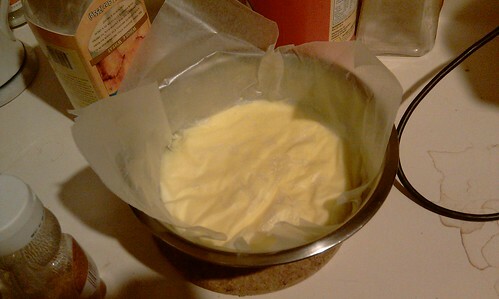 Then gently fold in the remaining whites, stopping when you can no longer make out streaks of egg white in the mixture. Bake for about 35 minutes, until an inserted toothpick comes out clean. Cool the cakes in their pans, on a cooling rack, for at least an hour. When completely cool, run a knife around the sides to release the cakes, cover each pan with a wax paper-lined plate, and flip. Lift the pans off of the cakes and carefully peel off the parchment. Wrap the cakes in plastic wrap, and refrigerate for at least three hours. When the cakes are thoroughly chilled, cut each in half. Place each layer on a wax paper-lined baking sheet or plate. Whisk all the ingredients together in a saucepan. Bring the mixture to a boil, whisking constantly (so the eggs don’t scramble). Turn the heat down to a simmer and whisk constantly until thick. Remove from the heat, transfer to a bowl, cover with wax paper, and cool in the refrigerator for at least three hours. 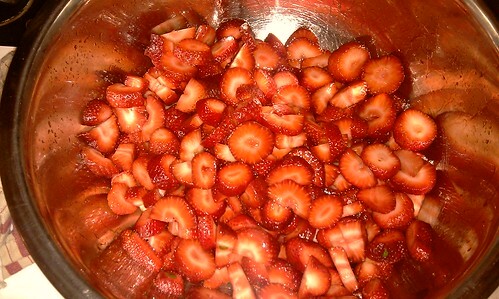 Slice the strawberries thinly and place them in a bowl. Add the sugar and stir. Let the mixture sit for at least an hour, giving it an occasional stir. When the strawberries have released their juices, strain the mixture in a colander, saving the juice in a separate container. Place one cake layer on a wax paper-lined baking sheet. Brush the top of the layer with 1/3 of the reserved strawberry juice. 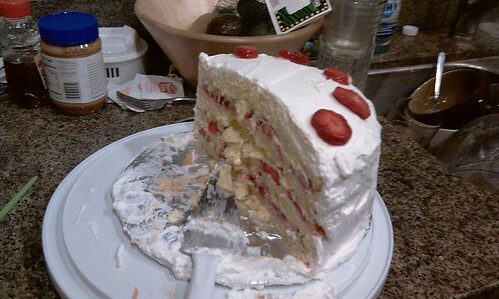 Cover with a layer of strawberries, and then with a layer of custard. 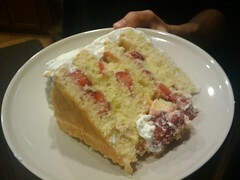 Top with the next layer of the cake, and repeat: strawberry juice, strawberries, custard, cake layer. And again. 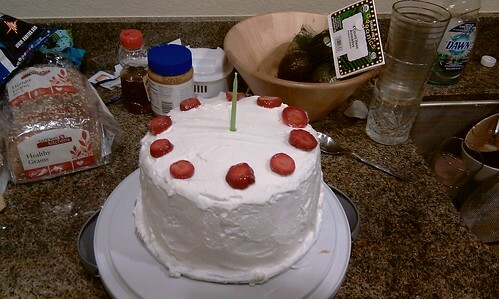 Then, cover the cake with the whipped cream and decorate it however you like. Chill the cake for at least 8 hours before serving. Bring to cool room temperature before serving. This entry was posted in baking, berries, cake, custard, dessert, fruit and tagged berries, Cake, Cassata, Cleveland, Custard, Sponge cake. Bookmark the permalink.